Rinse and sort beans. Put beans in 6 qt. crockpot that's bean sprayed with Pam. Add roast on top of beans. Add all other ingredients, making sure water completely covers the roast. Cook on high for about 8 hours or until beans are done. Using two forks, shred the roast and mix it well into the beans. This might work better if you removed the roast to a plate to shred, then added back to the crock. 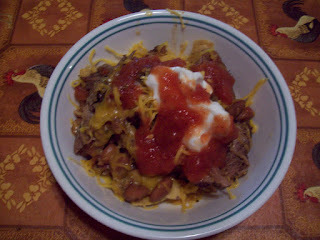 Serve in bowls over Fritos with shredded cheese, salsa, sour cream, guacamole, and any other tex mex toppings you enjoy. It is also very good served over rice. that looks so good! I just wished I had cooked it for our supper too. Can I just say, "Yum, Yum, Yummy!" I just read it off to my husband and sister and they want me to make it for dinner tomorrow night...for my sister's birthday dinner! I have been tagged and you are next. BTW, LOVE the blog layout! Just had to let you know that I am currently cooking this lovely dish in my crockpot right now! I am totally trying the bean chalupa! Thanks for sharing.